I crocheted this rag rug in a few hours, from one single cream coloured sheet and half a queen sized blue duvet. 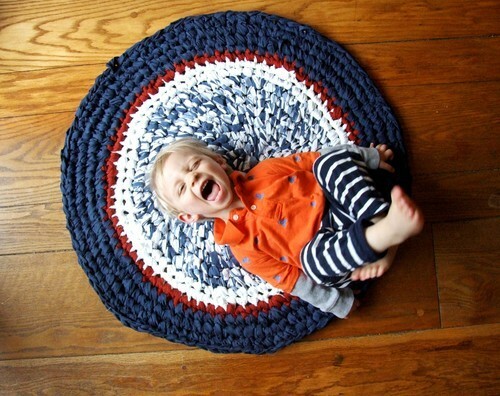 No pattern needed; just make a magic circle, squeeze in 8 to 11 half double crochets into the loop and start crocheting around. I varied the rows with half double crochets and double crochet stitches using a size Q hook…fun, fast, frugal! I ripped the sheets length wise into strips about 1 1/2 ” , leaving an inch or so at the end, then snipping 1 1/2 inches over to start the next strip. No need to tie ends together; the strips were continuous. Not perfect but I am still thrilled with my first rug. 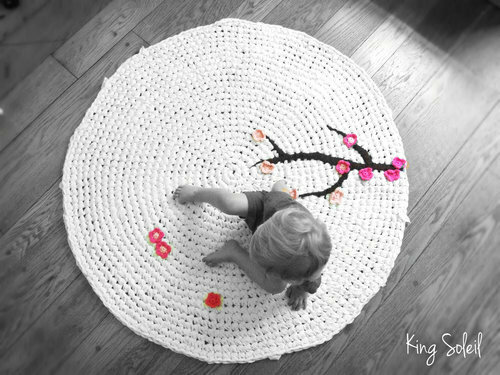 When I was little my Mom taught me how to crochet this type of rug, and anything else I learned just by watching others. My only problem is I cannot read a pattern sample. 😦 I never thought of crocheting with material, and yours looks wonderful. Thanks for sharing. Have a wonderful weekend. crocheting with binder twine to make cheap baskets! Previous Previous post: Talking to Grandma’s Afgan? Yup!